This chapter aims to introduce the policy perspective of the relevant European funding stream, tracing the evolution of the science with and for society call from the first Framework Programme through to Horizon 2020. It also introduces the Pupil Research Initiative (PRI) and how the Chain Reaction project built upon PRI's legacy, using its successes to inform a project that was relevant across Europe. 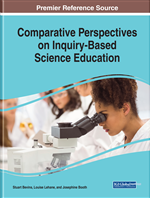 The chapter highlights the key aspects of the chain reaction project, for example the Pupil Research Briefs (PRBs) and Express Yourself Conferences, and how these were adapted, and in the case of the PRBs, expanded upon to be more relevant to different partner contexts and the needs of their education systems and curricula. In 2000 the Lisbon European Council set the EU the target of becoming the most competitive and dynamic knowledge-based society in the world, by adopting strategies to offer tailored education and training, promote employability, and to foster social mobility and inclusion. Economic sustainability is at the core of the European Union. The European Commission (EC) has a series of benchmarks that aim to give an overview of progress in meeting its strategic goal of “smart, sustainable and inclusive growth” (Europe 2020: A European strategy for smart, sustainable and inclusive growth, 2010, p8) by 2020 and these run through many of the communications and plans produced by the EC (e.g. Joint Report of the Council and the Commission on the implementation of the Strategic Framework for European cooperation in education and training, 2012). In pursuing this aim it is recognised that science, innovation and technology play a key role in the evolution of knowledge based societies and the implications for people of all ages with the need for “new basic skills, including entrepreneurship, science and technology” (Making a European Area of Lifelong Learning a Reality, p12). Also the possibility of growing human capital via building networks across Europe for both knowledge and science. 2004's Innovation Management and the Knowledge-Driven Economy underlines the importance of innovation and supporting public awareness initiatives to build citizens’ trust and confidence to “foster competitiveness in companies and well-being in our societies” (p11). The report also identified the need for structures and schemes to promote innovation in Europe and also to encourage EU cohesion and the spread of good practice via members working together. As mentioned above, there are a number of reports and communications from the EC and other organisations on the need for citizens to be positive towards science and to have an understanding of science and scientific rationale. This understanding is necessary to be able to engage with the world at large and to provide the skills they need to live in today's knowledge society and to make informed choices. Additionally, as science and technology are recognised as being at the core of socio-economic development (OECD, 2006) it is therefore vital that there are enough people trained and educated to a sufficient level to ensure progress these areas. However it has been found that few young people see science as a subject to pursue. The relative numbers of students taking science subjects at university are falling, with this being seen particularly acutely in relation to girls (OECD, 2006). It is then unsurprising that the EC has been funding projects to support and advance scientific research and innovation across member countries and beyond since 1984. As Europe 2020 - A European strategy for smart, sustainable and inclusive growth noted, greater research capacity in combination with resource efficiency improves competitiveness and helps to create jobs.